Statement of the Hungarian Helsinki Committee1As agreed with the Hungarian Helsinki Committee, we are publishing, in English and Russian, the statement published on its website on 13 June 2017, in its original form. 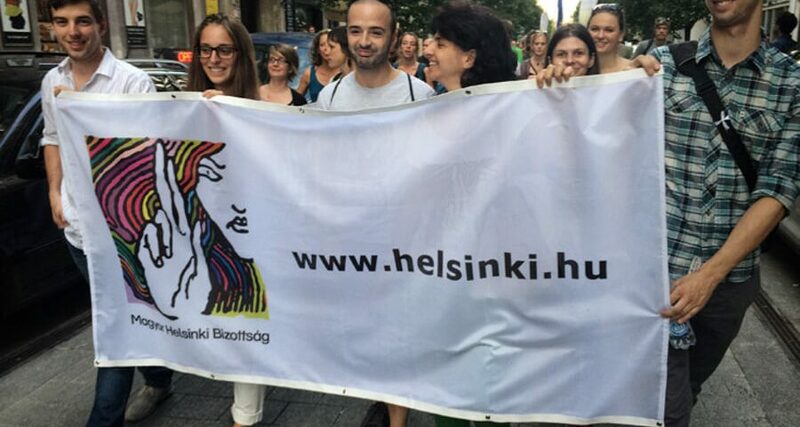 On 4 July, a new statement was published jointly by the Hungarian Civil Liberties Union, Hungarian Helsinki Committee and Liberties. The Law on the Transparency of Organisations Receiving Foreign Funds, the NGO Law was adopted today by the governing majority of the Hungarian Parliament, despite repeated domestic and international objections. Hungarian society and civil society organisations must not stay silent. In a European democracy, a strong civil society is an essential pillar of democracy and there is no place for stigmatising NGOs. As a non-governmental human rights organisation, we often witness that those who dare to stand up for their rights against someone much more powerful, even when the situation seems hopeless may succeed. Our mission and our duty to help our clients inspire us to act when state power turns against civil society itself. In resisting these attacks, we rely on the law and the public. Hence, the Hungarian Helsinki Committee has decided not to register as a foreign-funded organisation and will use all available legal avenues against the law that violates the Fundamental Law of Hungary and the European Convention on Human Rights. What is the NGO Law about? Under the law adopted today, the Hungarian Helsinki Committee should register as an “organisation receiving foreign funds” in a state register, and should display this stigmatising label on all of its publications. As part of the Civilizáció campaign, together with 263 other civil society organisations, the HHC has been protesting against this stigmatisation from the outset because it is unnecessary, harmful and discriminatory. (A new joint NGO statement was issued today.) The NGO Law does not enhance transparency, but only serves the interests of the government. The Helsinki Committee will not comply automatically with a law that breaches the Hungarian Fundamental Law, the European Convention on Human Rights and European Union freedoms and which evokes the darkest periods of history. Accordingly, we will not register as a “foreign-funded organisation” until the NGO Law is reviewed and approved by the Constitutional Court and/or the European Court of Human Rights. While of course we would not want to see the Helsinki Committee dissolved, we will avail ourselves of all available legal options. Because of our clients, we cannot risk our existence; however, we firmly believe that automatically complying with rules which are in breach of fundamental rights would jeopardise our own credibility. We always advise our clients to resort to available legal remedies; hence, we cannot take another path either. The activities and the finances of the Hungarian Helsinki Committee are fully transparent. Since 2003, each year we fulfil our legal obligations to submit annual public benefit reports to the court and we also publish these reports on our website. Without an exception, all our – foreign, as well as domestic – donors can be found in our annual reports, along with the exact amounts of their donations and descriptions of how we used these funds. The NGO Law does not create new rules on transparency. Its aim is not to reach a higher level of transparency, but to stigmatise certain organisations (whom the law calls “foreign-funded” but who are referred to as “foreign agents” by the prime minister) and to exclude them from other civil society organisations. Ten days ago, the Preliminary Opinion of the Venice Commission exposed in detail the fundamental rights violations of the draft law2The final Opinion of the Venetian Commission with essentially the same conclusions was published on 20 June with.. The adopted law contains merely cosmetic changes from the recommendation made by the Venice Commission, while leaving the fundamental breaches and flawed character of the law unchanged. In spite of all the recommendations made by international bodies who had expressed concerns over the draft law, to discuss the draft proposal with Hungarian civil society organisations before its adoption, the Government did not comply with this either. What action will the Helsinki Committee take now? The Hungarian Helsinki Committee will make use of all legal and publicly available options to take action against the law which seriously breaches fundamental rights. 1. In order to enforce our rights before the courts, we will not register as a “foreign-funded” NGO unless a court orders us to do so. 2. We will submit a constitutional complaint to the Constitutional Court without delay. 3. We will submit an application to the European Court of Human Rights. 4. In the Hungarian judicial procedure, we will petition the judge to request a preliminary ruling from the Court of Justice of the European Union in Luxembourg, as in our view the Hungarian law is not compatible with the fundamental freedoms of the EU. 5. We will continue to work together with many other Hungarian NGOs in the campaign to deliver the message to every member of Hungarian society: civil society organisations work for the benefit of the entire society, and a vibrant and independent civil society is an essential part of a strong democracy. 6. We will continue to inform the main international organisations and the international public about the Putinesque stigmatisation of civil society and NGOs. An NGO cannot aim to give up its goals and to abandon its clients. The Helsinki Committee has a lot to do, even more than before. We see that since the illiberal turn, there is an ever greater need to defend human rights and also an ever greater need for human rights defenders in Hungary. The inmates in prisons, the refugees seeking asylum, the victims of the violations of the state, our fellow citizens stripped of their liberties, marginalised citizens and the rule of law itself all need us. Our clients need us and they are counting on us. Without us, many would be left on their own. For us, these people and their needs are the most important. 1. ↑ As agreed with the Hungarian Helsinki Committee, we are publishing, in English and Russian, the statement published on its website on 13 June 2017, in its original form. On 4 July, a new statement was published jointly by the Hungarian Civil Liberties Union, Hungarian Helsinki Committee and Liberties. 2. ↑ The final Opinion of the Venetian Commission with essentially the same conclusions was published on 20 June with.